* In May of 1988, having not, for one moment, believed that a man could develop Breast Cancer, Mark had a modified radical mastectomy, followed by chemo. and radiation. 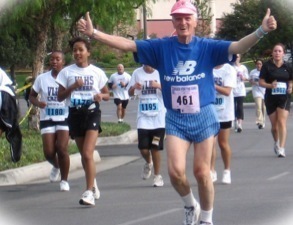 * In September 1992, he came to the Komen “Race for the Cure” by way of rejection. Having been told that, as a man, he would not be allowed to run . . . . .
For those who are now or may in the future, struggle with the physical assault and emotional challenge of Breast Cancer, there is an alternative to the “self-abusing” admonition of “Why Me?” with the adoption of the dynamic, uplifting and self fulfilling.